The United States has always been a nation of immigrants-never more so than in 1917 when the nation entered the First World War. Of the 2.5 million soldiers who fought with U.S. armed forces in the trenches of France and Belgium, some half a million-nearly one out of every five men-were immigrants. In The Long Way Home, David Laskin, author of the prizewinning history The Children's Blizzard, tells the stories of twelve of these immigrant heroes. 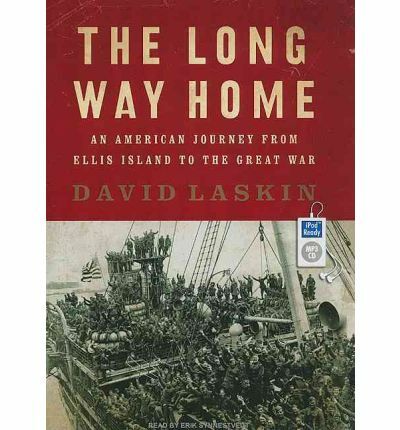 Starting with their childhoods in Europe, Laskin unfolds the saga of their journeys to Ellis Island, their struggles to start over in the land of opportunity, and the ordeal of their return to Europe in uniform to fight-and win-a war that had already killed tens of millions.Three of these soldiers died on the battlefield; two won the Congressional Medal of Honor; all were transformed forever by their experiences in combat. It is a transformation that continues to be felt in the pride and pain and cherished memories of immigrant families that have long since assimilated.In tracing the lives of these twelve men, Laskin tells the story of an immigrant generation-a generation that streamed into this country in unprecedented numbers around the turn of the last century, that sweated to support their families through back-breaking physical labor, and that fought loyally for their adopted country on the battlefields of Belleau Wood, Soissons, St. Mihiel, and the Argonne forest.Based on stories, letters, and diaries passed on by descendants-as well as Laskin's personal interviews with two foreign-born Doughboys who were still alive at the time he was researching the book, The Long Way Home is a reverent work of history and a deeply moving evocation of the dreams and sacrifice at the heart of the American experience. About the Author: David Laskin was educated at Harvard College and New College, Oxford. For the past twenty-five years, Laskin has written books and articles on a wide range of subjects, including history, weather, travel, gardens, and the natural world. His book The Children's Blizzard won the Washington State Book Award and the Midwest Booksellers' Choice Award for Nonfiction and was nominated for a Quill Award. Laskin's other titles include Braving the Elements: The Stormy History of American Weather; Partisans: Marriage, Politics and Betrayal Among the New York Intellectuals; A Common Life: Four Generations of American Literary Friendship and Influence; and Artists in their Gardens, coauthored with Valerie Easton. A frequent contributor to the New York Times Travel section, Laskin also writes for the Washington Post, the Seattle Times, and the Seattle Metropolitan. He and his wife live in Seattle. Actor Erik Synnestvedt has recorded nearly two hundred audiobooks for trade publishers as well as for the Library of Congress Talking Books for the Blind program. They include The Day We Found the Universe by Marcia Bartusiak, A Game as Old as Empire edited by Steven Hiatt, and Twitter Power by Joel Comm. Note: This mp3 audio book is in mp3-CD formatting. This means it will only play on CD players especially fitted to play mp3-CDs. It also can be loaded onto a pc or mac and copied over to a variety mp3 players and played on them.